Why is currency designed the way it is? What security features are incorporated? How has the look of currency changed over time? How do exchange rates work, and how do they affect travel? Elementary Economics for Sixth Grade: Currency and Its Impact homeschool social studies students learn the answers to these questions and more. Go to Class Lessons and download the lesson plan, lessons file, and activity sheets. Start with the Day 1 assignment. Follow the instructions each day on the lesson plan and check them off when completed. 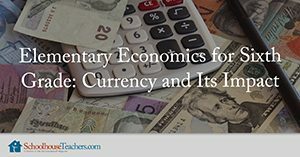 Elementary Economics for Sixth Grade: Currency and Its Impact homeschool social studies lessons use printable activities, discussion questions, and online resources to teach homeschool students fundamental concepts in economics. Discuss the different notes used in the United States. Discuss a few different notes used in other countries. Discuss how bills are designed (Bureau of Engraving and Printing). Research the steps for creating a bill. Explain that our currency is printed with cotton and linen to make it more durable. Discuss the many elements within the design of each note (shapes, lines, symbols, pictures, detailed designs, color, texture). Try to find these elements within our currency. Review the elements within each note. Begin designing your own currency. Make sure you include at least some, if not all, of the different design elements on your notes. Continue working on your currency design. Present your design and explain your design choices. 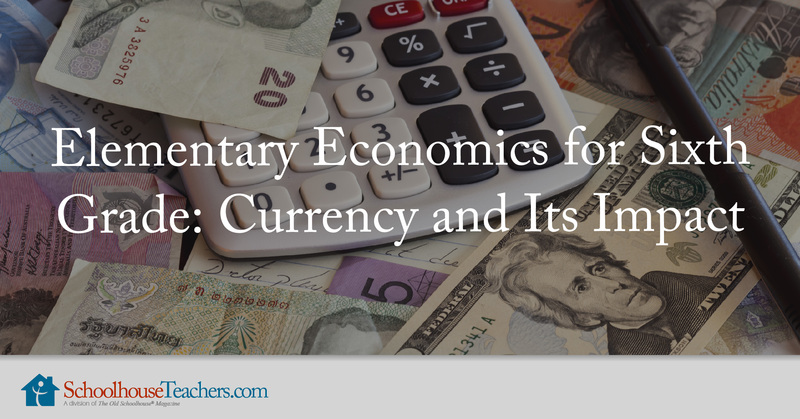 Through printable activities, discussion questions, and online resources, Elementary Economics for Sixth Grade: Currency and Its Impact homeschool social studies students learn the basics of how currency works, how it is used, and why exchange rates work the way they do. Would you like to tell others about this Elementary Economics for Sixth Grade: Currency and Its Impact homeschool social studies course?